Under Jayavarman IV the style of Koh Ker was developed and the art of sculpture reached a pinnacle. A great variety of wonderful statues were chiselled. 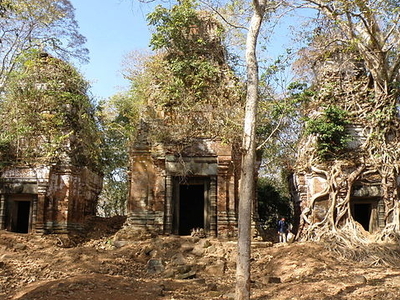 Because of its remoteness the site of Koh Ker was plundered many times by looters. Sculptures of Koh Ker can be found not only in different museums but also in private collections. Masterpieces of Koh Ker are offered occasionally at auctions. These pieces in present times are considered stolen art. The site is about two and half hours away from Siem Reap, and basic visitors' facilities are now being built. This makes Koh Ker very attractive for anyone who would like to experience lonely temples partly overgrown by the forest.Since 1992 the site of Koh Ker is on the UNESCO tentative World heritage list. The huge Baray (water-tank) called Rahal is the largest object at the site of the ancient capital Koh Ker. Its length is about 1,200 m (1,312 yd) and its breath about 560 m (612 yd). The water-tank has three dams covered by steps of laterite. The orientation of the Rahal is not from east to west like the huge water-reservoirs in Angkor; it follows an orientation of North 15° West. Because the most important monuments at Koh Ker have the same orientation one can conclude that the Baray was constructed first of them. The Rahal was carved out partly of the stone ground but its not clear if a natural hollow was the reason for its orientation. 200 m (219 yd) south of the double-sanctuary Prasat Thom/Prang is a basin dug into the earth with a length of 40 m (44 yd). It has steps of laterite on all sides. During the rainy season the water is standing to a depth of 7 m (23 ft 0 in). The Trapeang Andong Preng does not belong to a temple. But it could have been a royal bath, because near this place was once the wooden palace of the king. The complex of the main monument in Koh Ker has a linear plan and is about 800 metres (875 yd) long. Its orientation is E15°N, that is rectangular to the Baray. The parking area cuts the complex in two parts. On the east side of the parking are two structures, called palaces. On the west side are the other monuments. At the east side of the parking area are two structures the so-called palaces. Each consists of four rectangular buildings surrounding a court. All eight buildings have three rooms, some have a patio with pillars. Possibly these palaces served as meditation- or prayer-rooms for the king or nobles. Behind the ruins of the entrance-pavilion and the laterite towers is an impressive red brick tower, called Prasat Krahom (krahom = red), which gives entrance to the enclosed monuments. It has a cruciform plan, is in a good condition and once housed a statue of the Dancing Shiva with five heads and ten arms. The sculpture of a height of 3.50 metres (11 ft 6 in) is broken completely. The moat in the eastern court is about 47 metres (154 ft) wide. It borders the Prasat Thom. Lined by trees it lookes really pictorially. Two dams, one at the east side, the other at the west side are leading to the ground within the moat. Probably some parts of the Prasat Thom including the moat and the 1. (inner) enclosure were built before 921 AD. The sanctuary was expanded unter the reign of Jayavarman IV and has now two surrounding walls inside of the moat. 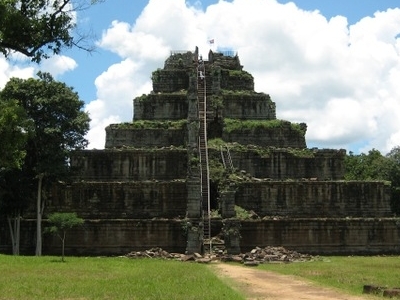 The seven‑tiered pyramid called Prang was probably the state temple of Jayavarman IV. Construction of the sanctuary was started in 928 AD. At ground level one side of the square building measures 62 m (203 ft). The height is 36 m (118 ft). Originally on the top platform stood a huge lingam probably more than 4 m (13 ft) high and having a weight of several tons. Inscriptions say that it was the tallest and most beautiful Shiva-lingam. Behind the court with the seven‑tiered pyramid is an artificial hill of exact circle form covered with trees. It is named Tomb of the White elephant. "The white Elephant" is a very well known legend in southeast Asia.There are different theories about the hill. Some say that this structure could be the foundation of a second pyramid. 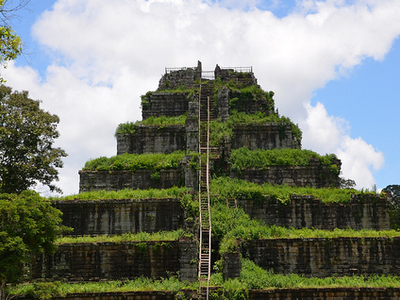 Here's the our members favorite photos of "Archaeological in Preah Vihear". Upload your photo of Koh Ker! So far only Angkorbestdriver wants to visit Koh Ker. Do you want to visit Koh Ker Click here?